Hindrance comes from the same mold that gave us Complications, Endangered, Predicament and Inferiority. Namely, you get the opportunity to draw three extra dilemmas and then spend three extra in total cost on the dilemmas you give your opponent's personnel to face. This comes at a price though: you have to kill a unique Future personnel who costs 3 or more. You may be thinking that there are only a handful of unique Future personnel who cost 3 or more, and you would be wrong. Well, technically you would be right, but you would also be wrong. By playing The Play's the Thing, you can give each personnel you own (including those in your deck, not yet drawn) who costs 3 or more the Future icon. As long as your deck includes some high-cost personnel, you'll never be short of someone to kill to "hinder" your opponent. Even without The Play's the Thing, there are a couple of decks that could really take advantage of this card. The most obvious is a Klingon High Council deck. 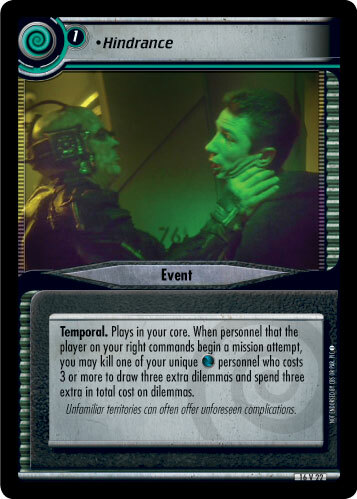 Not only can you download Hindrance with K'Tal (Senior Council Member), but you can then use it to kill Alexander Rozhenko (K'mtar) whenever your opponent's personnel begin a mission attempt. That means you can play another copy and download even more cards – including two events at cost -3. Just remember to download your final copy of Alexander at the same time, to repeat the process all over again. If only there was some way to get him back from the discard pile, then you would really have a loop. Voyager decks using the Revised Future personnel will also have ample fodder for Hindrance, because no less than half of the eight Revised personnel cost 3 or more. Much like the Klingons, you shouldn't have any problem getting one into play, because you can download Future Voyager Holograms with Revised Tuvok (Evil Instrument of Destruction). Hindrance will also help you if you ever want to include a shuttlecraft in your deck. I know a certain designer thinks 'shuttlecraft' is a dirty word, but the Drake (Voyager Shuttle) becomes very playable when you have a Temporal event, such as Hindrance, in your core. The shuttle only costs three counters to play, requires just one staffing icon to fly and does not prevent your personnel from attempting missions while aboard – unlike the Delta Flyer (Innovative Vessel). Moving on to individual personnel who could make use of Hindrance, we come across Data (Lucasian Chair). Once you have completed a mission requiring Diplomacy or Leadership, you can play Data for just one counter. That will make killing him later on much easier. Finally, as Johannes hinted at in his recent article, Ajur and Boratus are also prime candidates for sacrificing to Hindrance. You can play them to fix the top dilemma of your pile before killing them and repeating the process over and over again. Final Thought: There are over 375 personnel in the game who cost 3 or more. If you were to use The Play's the Thing, what's the best combo for Hindrance you could come up with?